This Friday (tomorrow) is the Bi-Monthly Swap Meat at Urban Mo's! What is the Swap Meat? It's a Cruising and Social party where people from around San Diego bring their used and old Leather, toys, and gear to Sell, Buy, and Trade to find new homes for them! The Swap Meat is from 7-9, leading in to Gear Weekend at the San Diego Eagle! This one will be bigger than the last two and feature a Puppy Play Mosh! If you've ever been interested in Pup Play, whether that be as a Handler/Owner or as a Pup, this is a great way of taking a look at this style of play! Additionally, this year's Mr. San Diego Leather (Doriam Couto) and San Diego Bootblack (Shilo Vix) will be hosting their own table filled with Leather Goods and products to kick off their Regain, Restore, and Redistribution project for their title year! Here's a sneak peak at some of the items they'll have on their table! For more information, scroll down to "From YOU to ME!" Fetish Men is BACK with our Monthly Fetish Social at the Eagle! This month, we are taking advantage of the events already happening that lead up to International Mr. Leather 40 and International Mr. Bootblack 26 next weekend! Join FMSD from 9 to Midnight at the San Diego Eagle for our Gear Social! We will have a few bootblacks present to tend to your Leather and Gear, Doriam and Odin will be behind the bar slingin' drinks, and you'll get the chance to hang out with your Brothers in Leather! It's also #JockstrapFriday so when it gets a little warm in your gear, you can check your gear into the back and strut your stuff! 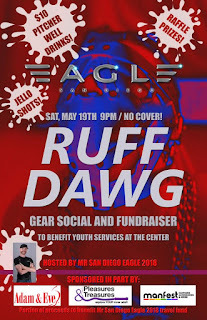 If you are so inclined, you can support our local Leather boys San Diego organization by purchasing Jello Shots for $1/each! 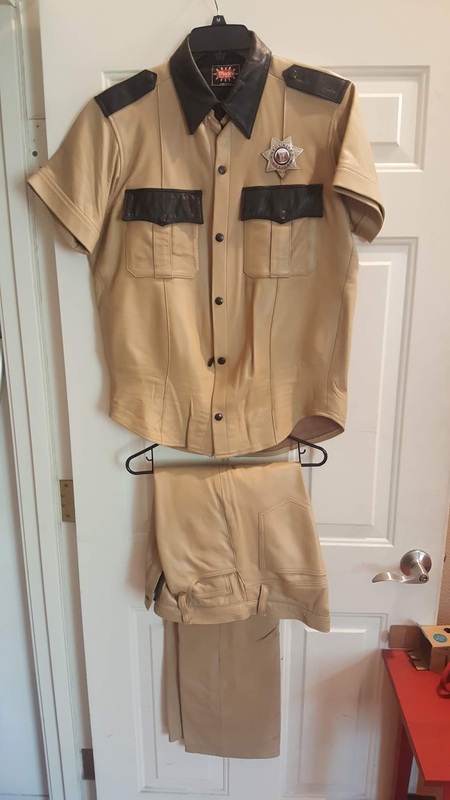 This is a great opportunity to bring out the gear you get at the Swap Meat and get it tended to by our community Bootblacks! 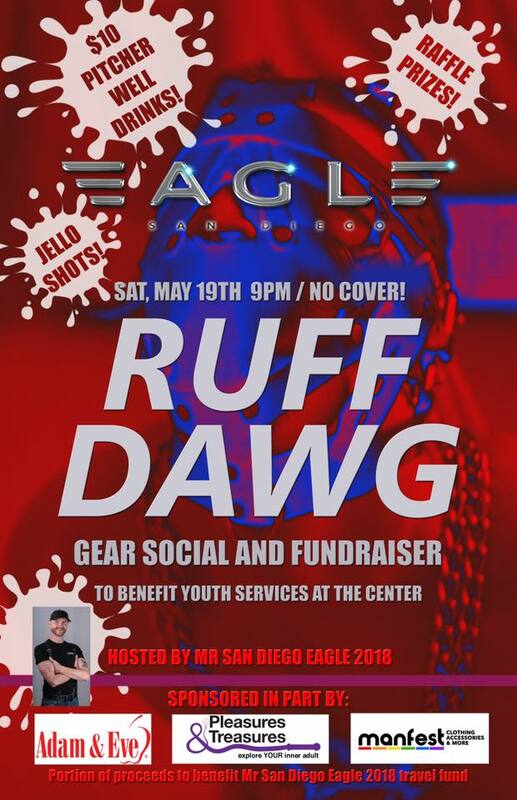 Join this year's Mr. San Diego Eagle (Jody) in hosting RUFF DAWG a Gear Social and Fundraiser at the San Diego Eagle! This event is a fundraiser to benefit Youth Services at the Center! MrSDE18 will have gear present to auction/raffle off, so be sure to stop in and see what great new items you might pick up for yourself! FMSD: Gear Night @ The Eagle! Cost: Support the venue, otherwise FREE! Cost: Free to attend, please support the venue! Description: Greenhorn is this year's Mr. San Diego Leather's major project in trying to make Leather more visible and inclusive to Leatherfolk under the age of 35 and People of Color! Each month, Doriam will host a Leather takeover at traditionally queer spaces (Mo's, Flicks, the Rail, etc.) to draw attention to our Leather community and to welcome people who may otherwise have had no idea the community exists! The event is open to EVERYONE, with the primary focus being the enrollment of people who have felt alone in our spaces! For more information, email MisterSDL2018@GMail.com and follow Mr. San Diego Leather 2018, Doriam Couto on Facebook! Here's one of two new sections to the blog! A minor recap of our last workshop. This month we did a Food Play and Gunge (aka Wet&Messy) workshop led by Doriam! Won't go into too much detail, but here are a few photos for you! 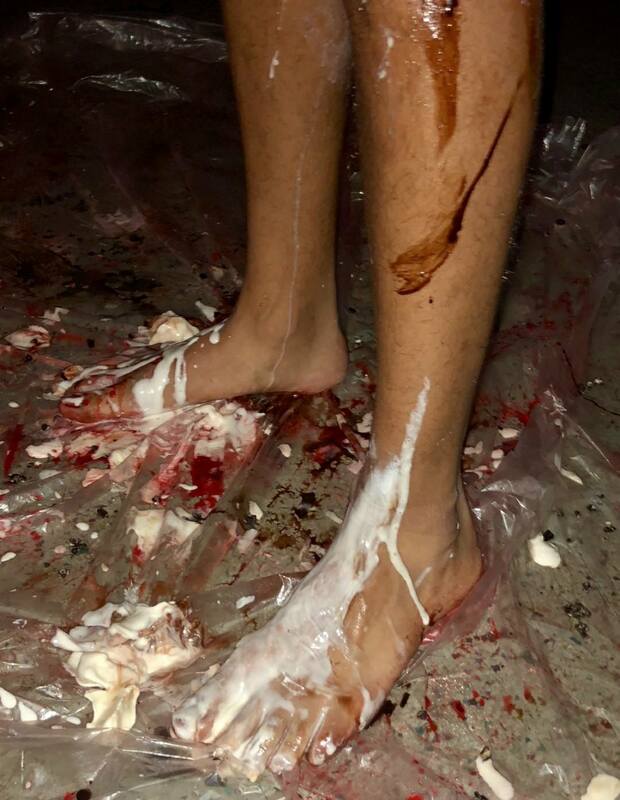 We might have made Doriam into a Human Sundae... and it looks like he hated every minute of it. This is another new section for us, if you have an ad, shout out, etc. you'd like to include into the blog posts, you can email DoriamFMSD@GMail.com or FetishMenSanDiego@GMail.com and we will do our best to include them! This includes anything leading to personal blogs, reaching out to brothers for individual meetups or trying to schedule events! It's been a while since I did this, but From ME to YOU is back! I just wanted to say thank you to each of you who have supported me and Fetish Men San Diego along the way! It's been a great adventure so far, and I'm so proud to see the growth of this organization over the last year and a half. This part is where I often babble about whatever is coming up on my end of the world so that it doesn't come up as a surprise. Right now, I am working on my Pin Run project which features my years hashtag, #LetsWalkTogether, for more information follow the hashtag link. 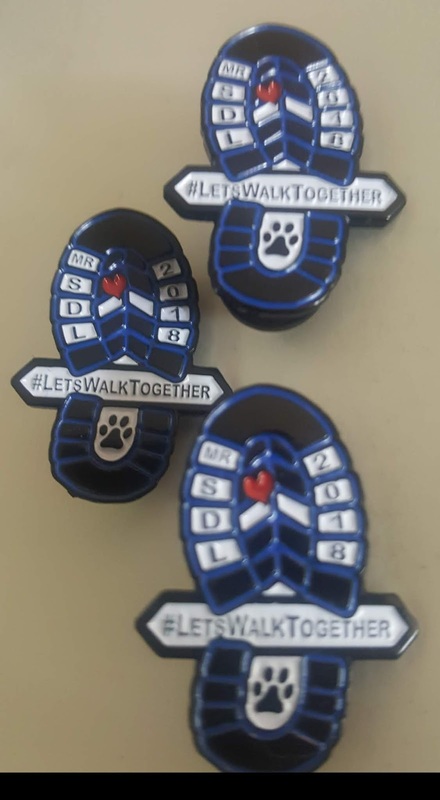 Pins are $8 each and +$3 S&H. This goes to support Our Safe Place, a branch of San Diego Youth Services, with a portion of the proceeds benefiting the SDLP2018 and SDLP2019 Titleholder Funds. Additionally, Shilo and I have our personal title project to Reclaim, Restore, and Redistribute Leather with a History. Throughout the year, we will be partnering with Thrift Stores and local Leatherfolk to hear the stories of the Leather that they have collected over time, and bring new life and love to them. 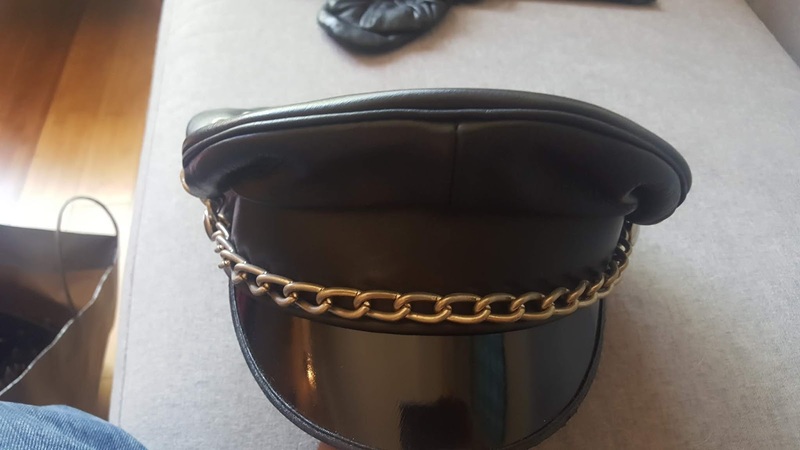 If you, or someone you know, has Leather or Fetish Gear that they no longer want/need, please have them reach out to me (MisterSDL2018@GMail.com) and I would love to find new homes for their gear. As a part of this movement, we try to get a bit of information about the history of the Leather's owner(s) so it can be shared with the new recipient. Please feel free to reach out if you want to know more about any of these things! Because of the weather, we've changed the destination of today's workshop to the San Diego Eagle. 4-6 and it will be a potluck in addition to a workshop! See you there!! Hello, This event has been expanded to include a Puppy Mosh Pit and after dance hours.. All before IML. You can also find us on Facebook, and Instagram. I was so impressed by the one before THAT, I wrote this article. #SDLP2017 - Nathan's Send-off to IML! Cost: Free to Attend, please support Nathan & the venue! Come celebrate Nathan's Title Year as he competes for the 40th International Mr. Leather competition in Chicago later this month! All funds raised will help support his travel expenses, with any excess going to Sunburst Youth Housing! Gear Night at the Eagle hosted by FMSD! This month, throw on your favorite boots and gear and swing by the Eagle on the 18th! We'll be auctioning off some new and restored gear that evening through FMSD and #LetsWalkTogether to share our local Leather History!